KTR Promotions in Venice Beach & Los Angeles California: November 21st, 2015, “Mirrors of the Mind 4: The Psychotherapist as an Artist” opens at Art Share LA. November 21st, 2015, “Mirrors of the Mind 4: The Psychotherapist as an Artist” opens at Art Share LA. On Saturday, November 21, 2015 “Mirrors of the Mind 4: The Psychotherapist as an Artist” opens at Art Share LA. Presented by the Community Outreach Committee of the Los Angeles County Psychological Association, this event celebrates its fourth year. Artists have been chosen via a juried selection process. The jurors are: Robert Bilder PhD, James Catterall PhD, Rebecca Catterall, and Gus Harper.The event will also feature poetry and music. The Los Angeles Psychological Association (LACPA) represents licensed psychologists within Los Angeles County by responding to the mental health needs of the community. Its purposes are to advance the science and profession of psychology and promote human welfare while educating the public about psychological issues. 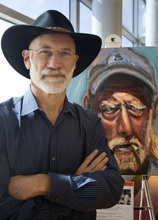 This year’s event will feature work from Dr. Stuart Perlman. A psychoanalyst, psychologist and artist, Perlman has become well known for his powerful paintings of the homeless. Dr. Perlman reminds us that these individuals, too, are to be valued: "If we can see into their faces and learn their stories -- their hopes, dreams, accomplishments and fears -- we can no longer pretend that they don't exist...we can no longer look the other way." LACPA’s goal is to increase the awareness of the general public about mental health issues, the profession of psychology, and the mission of LACPA. The Mirrors of the Mind Project reflects just that that. Founded in 2012, by Terry Marks-Tarlow, Ph.D., and Pamela J. McCrory, Ph.D., the success of the event has increased with each new year. Co-founders Tarlow and McCrory curate the group show and both agree that they feel the annual event is a perfect example of the importance and power of creativity. Co-curator and artist Marks-Tarlow is also a psychologist and clinician and sees the benefits of the artistic process in herself as well as her patients. Her art will be included in the show. She is excited to see the art displayed in the gallery at Art Share LA, and celebrates the many talented artists who are a part of this community outreach event. Other artists set to be featured in the exhibition are Karissa Burnett, Alisa Dennis, David Feingold, Gary Felton, Christine Forest, Flora Golden and many more. “Mirrors of the Mind 4: The Psychotherapist as an Artist” officially opens November 18 with a reception taking place on Saturday, November 21st, 2015, from 5 to 10pm at Artshare LA, located at 801 E 4th Pl, Los Angeles, CA 90013. There will be a poetry reading 5-6pm as well as Community Art Creation from 4-9pm. Attendees can bid on an art silent auction. Live original music and light refreshments will be provided. The exhibition will run through November 28.